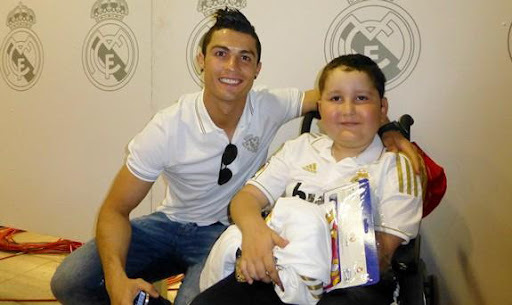 A nine-year-old boy has now been given hope by Real Madrid star Cristiano Ronaldo and his agent, Jorge Mendes, who are covering the medical bills for his cancer treatment. Nuhazet is a 9-year-old boy from the Canary Islands who has been battling cancer since before his second birthday. A story on Canarias Investiga reports that his family was told by doctors in March that there was nothing more they can do for their child, as it had spread to three different parts of his spine. As a result, the young boy's parents were instructed to make the most of his life while he is still alive. So to fulfill one of Nuhazet's dreams, his cousin Nati put a plan so that at least the boy could meet some players from the Madrid giants. She enlisted the help of some influential friends and got the attention of Mendes, one of the most powerful agents in football. Nati began to speak with Mendes, who then sent a car to collect the whole family on the morning of Madrid's final match of the season against Real Mallorca and take them to the team's hotel. Nuhazet met Ronaldo and, after a lengthy photo session with the whole family, he went to watch the match from Ronaldo's private box with his family and the winger's girlfriend, Irina Shayk. The next day, Mendes phoned Madrid president Florentino Pérez, who weeks later lost his wife to a long fight against lung cancer, to ask for a recommendation of a private hospital and the boy was taken to Montepríncipe Hospital on May 16. They then started a new course of treatment that included a personalized drug from the United States with Ronaldo and Mendes paying for everything. Nuhazet is still undergoing treatment and could return home in a few weeks as he is awaiting the arrival of his "personalised medication".